Aby and Jay were clearly surprised when I told them during lunch that I’d limited my wardrobe to 7 items for the past week. I didn’t tell them about it until the week was over because I wanted to see if they’d notice my repeat outfits. Guess what? They didn’t. Guess what else? No one did. It’s true. I didn’t turn into Stinky/Unclean/Unkempt Girl. I didn’t have people gawking at my lack of wardrobe variety. No one commented that my outfit would have worked better with some accessories. Like I said, no one noticed. 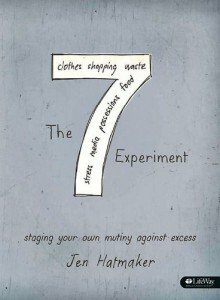 This whole 7-clothing-items thing was part of a study I’m doing with some friends called The 7 Experiment: Staging Your Own Mutiny Against Excess by Jen Hatmaker. The crux of the book is to spend one week drastically simplifying the areas of excess in our culture – food, clothes, spending, media, possessions, waste and stress. So much of this resonates with living a simpler, less cluttered, less stressful life. As we talked about it over lunch, Aby and Jay both asked if I’d share my experience on the blog. So, here goes! Besides my wedding ring, I did not wear jewelry or other accessories. You read that right – no scarves, no belts, no earrings. I don’t own a lot in the way of pricey stuff, but I really do love the jewelry I have. Most of it came as gifts, primarily from my sweet husband. So, I missed the jewelry most of all. I think that’s because of my sentimental attachment to it, but also because I felt like it would’ve really differentiated my outfits. Still, like I said, I seemed to be the only person who even noticed that I was wearing the same seven items all week long! Apparently no one else is that interested in my attire. Ha! Who knew? Anyway, I am sharing all of this with you because I came away with some really big takeaways that have made a big impact on me. Less stress. Having only 7 items to choose from took a huge amount of stress out of my day. I didn’t have to consider what might match what. It was a bit like Garanimals for adults in that any combination of items was going to work. I only had to consider the weather and what was clean. Easy peasy. Less laundry. I did not have a backlog of laundry. I had no choice but to stay on top of laundry, and so it never reached the point of feeling overwhelming. Wash. Dry. Wear. Repeat. Less decisions. I don’t enjoy putting outfits together as much as I thought I did. In fact, on my first day off the clothing fast, I realized I was actually feeling anxious over choosing an outfit for the day. Now in addition to the weather, I also had to consider what looks good with what? Which shoes or boots work with those pants? Does that belt look OK with that necklace? It was a really nice break to have fewer decisions each day. Less really is more. This has taken on new meaning for me. I’d rather have a few pairs of jeans that fit great and that I love to wear every time I put them on than to have a drawer full or jeans that aren’t quite right. I’d like to have only my favorite things hanging in the closet so that what I grab to put on is going to look and feel good, because then I can skip the stress of that, “Oh, I forgot that I seriously hate how this sweater fits and now I have to come up with another outfit” thing. This happens to you, too, right? It’s only useful if I’m using it. Now, I’m not talking about off-season clothes or anything like that. But take, for example, my stack of T-shirts. Yes, they are all perfectly good and useful, but I only regularly wear a few of them. Why is there such a large stack? It’s because they are “useful” that I think I need to keep them. But after this experiment it hit me: they aren’t useful if I’m not using them. But…someone else could and probably would find these items useful. It’s time to purge. Since I organized my closet a few years ago, I’ve felt great about how I purge both seasonally and on an ongoing basis. However, now I’m aware of just how much more I can pare down. I may not ever reach the point of true minimalism, but I’m super happy to be shedding off some of the layers of excess, for sure! If you’ve ever tried anything like this, I’d love to hear your insights in the comments. What were your big takeaways? Also, be sure to let me know if you’ve read the book or done this experiment! And if you haven’t tried this…do you think you could do it? Are you up for the challenge? I think this is such a liberating idea. I was never exactly a clothes horse, but over the last couple of years I’ve really pared down (although not to your extent during your experiment). 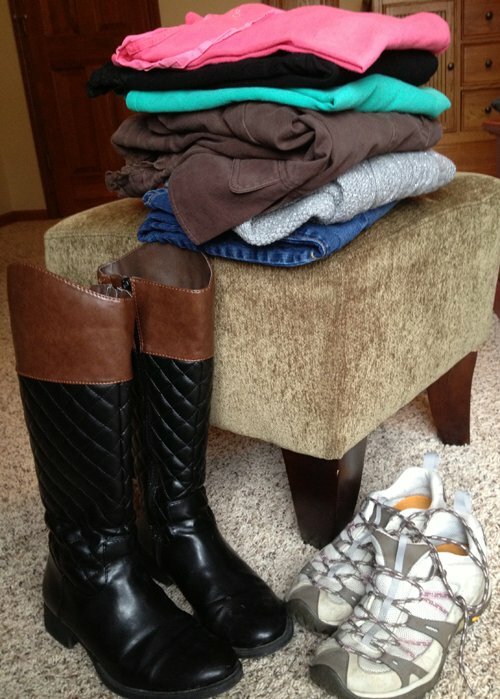 It’s so much easier not to have to deal with a lot of clothes and all the attendant care and decisions. And having fewer things makes laundry easier–your stuff is in rotation, so it can’t pile up the way it might if you have tons of clothes. (I also make laundry easier by repeatedly wearing things unless they are visibly dirty or no longer pass the sniff test. ) The key is to have plenty of underwear and socks! Very interesting post–thanks! Nancy, I have to agree about clean undies and socks! Good for you! I love this!!! Since leaving the corporate grind, I find that my wardrobe is paired down quite a bit yet I have a lot of stuff that is never worn. I think I’ll give this a try. I wonder if I’ll be as successful as you. I wonder, though, why you chose not to wear your jewelry? Thanks, Emily! Come back and post if you try. I’d love to hear how it goes for you! The short answer is that I was following the author’s lead on jewelry. And I’m glad I did it that way because it was very insightful to me. Jessica, good for you for figuring this out. It is so much easier, isn’t it? Thanks for your comment! Interesting! And as I have just finished a backlog of ironing that has been many months in the making, I certainly realize that I have far more clothes than necessary! And now that they are all in the closet, I have too small a closet as well! I can definitely pare down and will be thinking critically as I choose clothes for the next couple of weeks. Anything I put on and immediately take off again is going in the donation bag. I love that, Beth! Thanks so much for sharing. What a cool experiment! I hate deciding what to wear each day! This would make my life so much easier. Will you be applying this principle to other areas in your life? I hope to hear more! Hi, Monique. Thank you! Yes, I have also spent a week focused on food and am currently focused on possessions. It’s been amazing. I have tried organizing my closet in different ways before. I tried by colors, by function and etc. After reading your post, I started hanging my clothes by season section. 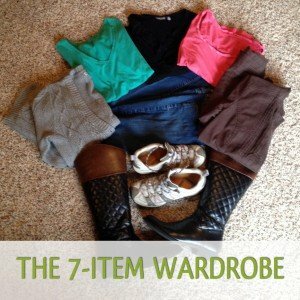 I paired down my winter clothes to 10 matching outfits. I love it! It feels so easy to get ready every morning. Thank you for the great post, hope you can write about the other 6 areas in your future post. I have been pretty good about this, but this is a good reminder to take a fresh look at it. What an interesting post! And the comments make it clear that others find it thought-provoking, too.